WWE Survivor Series 2015 is out on DVD and Blu-Ray now in the UK. You can order here at WWEDVD.co.uk and all other reputable Home Video stockists. Broadcast live on PPV (and on the WWE Network) from the Philips Arena in Atlanta, Georgia USA on 22nd November 2015. 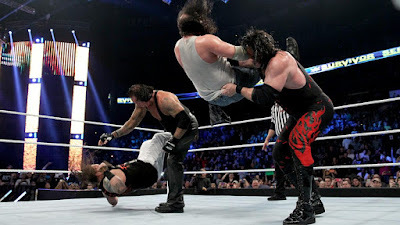 The show features The Brothers of Destruction clashing with The Wyatt Family's Bray Wyatt and Luke Harper in the main event. The Blu-Ray edition includes nine other matches featuring the likes of Dean Ambrose, The New Day, The Lucha Dragons, King Barrett, Charlotte, Paige, Sheamus, The Usos, Roman Reigns and Ryback in prominent bouts. Commentary is provided by John "Bradshaw" Layfield, Michael Cole, Jerry "The King" Lawler, Byron Saxton, Booker T & Rich Brennan. Survivor Series 2015 kicks off with a solid bout between Roman Reigns and Alberto Del Rio, as the pair battle it out in the Semi-Final of the WWE World Heavyweight Championship tournament. At times it feels like ADR is simply going through the motions, however it is some competent selling from Reigns that manages to drive the clash. 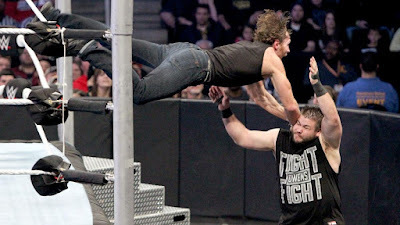 A second semi-final bout between Kevin Owens and Dean Ambrose is probably of a similar quality, with Owens standing out as the star of the bout as he works hard to lift a initially flat crowd. Despite an excellent finishing stretch, there are still portions of the match that one would expect to have been a lot tighter from workers of this calibre. The only Traditional Five on Five Elimination contest on the bout begins brightly with King Barrett and Sheamus bringing a different energy to The New Day's pre-match promo. However, the clash with Ryback, The Lucha Dragons and The Usos suffers from some bizarre booking, an off-beat pace and a crowd that doesn't seem to be interested at all. That being said, there are some nice spots peppered throughout the contest. The first title match see's Charlotte defending the WWE Diva's Championship in a scrappy fight with Paige, who was in the middle of another ill-advised heel turn. Whilst there are some nice ideas on display, the contest never really comes together, which isn't helped by a flat finish. Dolph Ziggler and Tyler Breeze then run through some decent sequences of action, but a lack of time, character-depth and crowd interaction hurt what feels like another throwaway match. The main event of the evening has The Undertaker and Kane teaming up once more, as The Brothers of Destruction, as part of the celebration of 25 years of The Undertaker, an idea that dominates the presentation of the bout. Opposite Bray Wyatt and Luke Harper of The Wyatt Family, there are a lot of cool moment that play well off the different characters signature move and mannerisms. The crowd being so into the action makes the match a lot more watchable than perhaps it would've been otherwise. 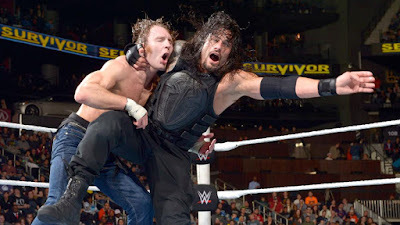 To close the show, Roman Reigns and Dean Ambrose are back to compete over the WWE World Heavyweight Championship, in what is a good, little match, which it's difficult not to feel disappointing by. The crowd continue to give a korma reaction to action, but they do wake up for the big post-match angle. From Survivor Series 2016 Kick-Off, there's another Traditional Five on Five Elimination bout, with The Miz, Bo Dallas, Stardust & The Ascension taking on Neville, The Dudley Boyz, Titus O'Neil and Goldust in a very meh kind of match. The wrestling throughout is all completely fine, but with no real drive and a lack of quality booking there's no real reason to check this one out. Onto the Blu-Ray exclusives and we start with a fun, back and forth between The Undertaker and Bray Wyatt on the mic from Monday Night RAW #1173, that build towards the PPV well. From the same show there's a contract signing between Charlotte and Paige for their bout, which features some strong mic from Charlotte and an enjoyable ringside brawl. An edition of Miz TV from Thursday Night Smackdown #848 with appearances from the four semi-finalists in the WWE World Heavyweight Championship tournament is highlighted by a comedic appearance from R-Truth. The set rounds off with a fairly straight-forward tag bout from the same show, with Kevin Owens teaming with Alberto Del Rio against Dean Ambrose and Roman Reigns. A distinctly average show here. The WWE World Heavyweight Championship tournament provides the best action across the disc, but with the four performers involved I think many would expect a lot better quality. 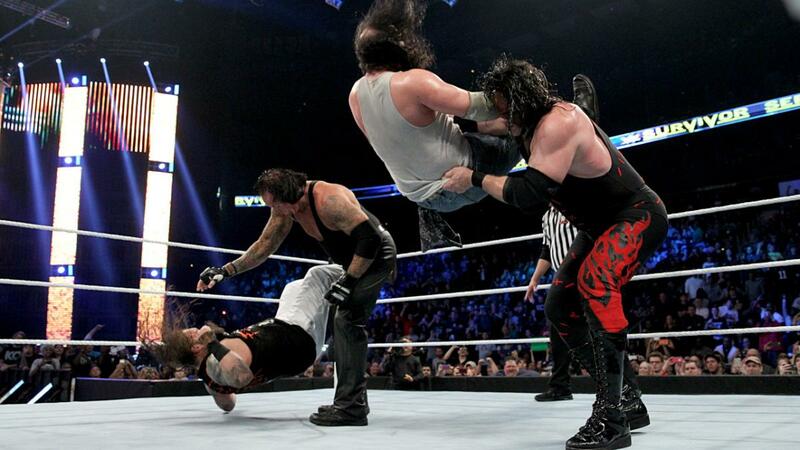 The Brothers of Destruction make for a fun main event, but one that ultimately lacks substance. The special features are also a bit of a downer, for not including any of the prelimary tournament matches. A miss opportunity to include the likes of Cesaro vs. Reigns, Owens vs. Neville or Ambrose vs. Ziggler, all of which could have boosted the quality of the content on the disc.